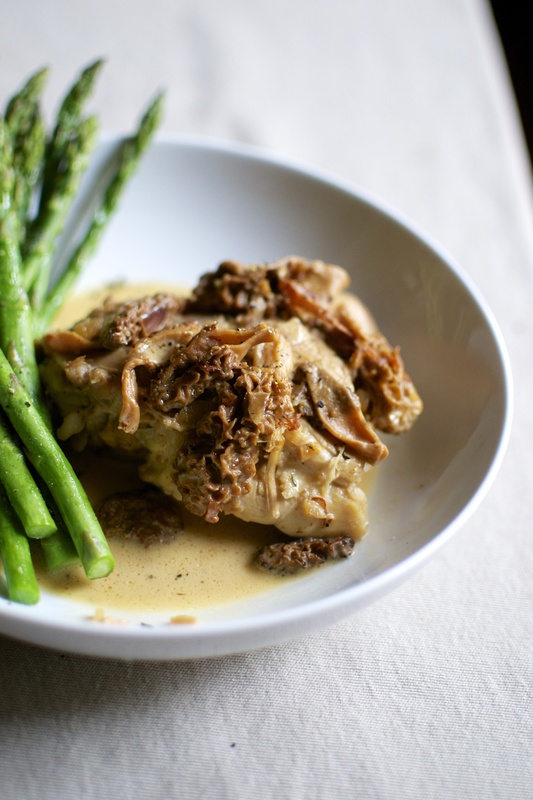 I really have to admit that, honestly, this Chicken with Morel Mushroom Sauce is one of my favorite dishes that I have ever made. Honestly. Ever. I don’t know whether the magic of the sauce is from the morels or from the sherry-based sauce..or the heavy cream. Who knows. It’s good. Real good. I came home to a huge bag of fresh picked morel mushrooms on my doorstep! A friend of mine foraged for them and thankfully decided to share his treasure! These puppies can go for as much as $40 per pound! We are eating like royalty over here! 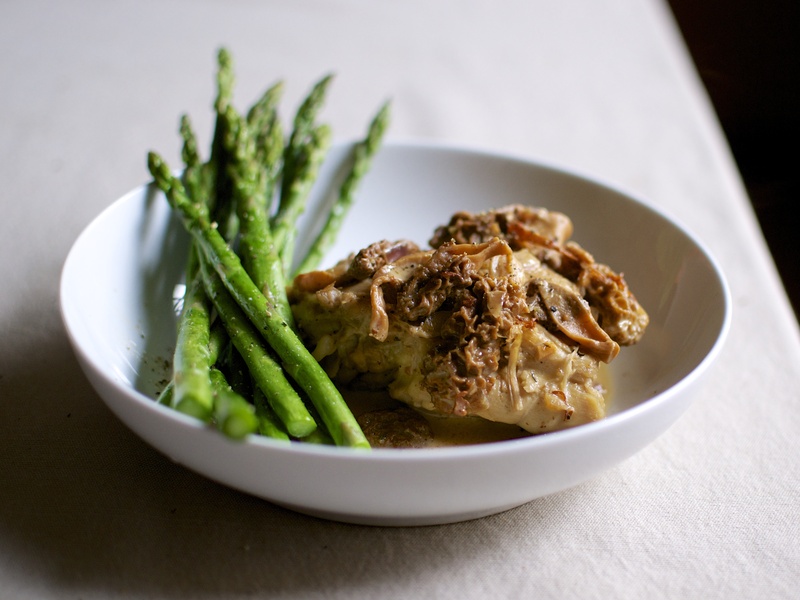 With such a large bundle of morel mushroom-delights, I decided to prepare a recipe that was provincial and special: a french morel mushroom sauce. This sauce deserves a trumpet of announcement. 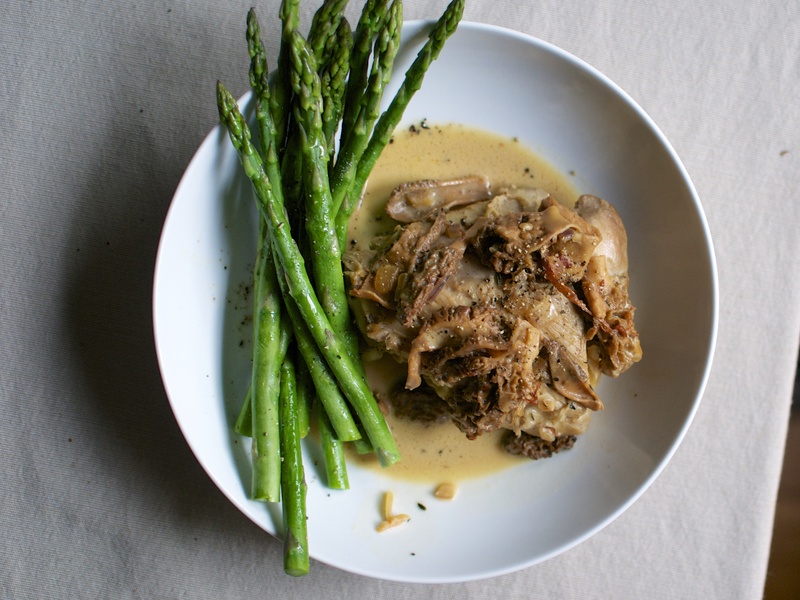 It deserves to be served in a bowl with amazing a crusty baguette, if you can have it. Sop it up. Don’t waste this sauce. With only 1/2 cup of heavy cream added at the end, the sauce is not heavy but it is substantial. I also think that adding champagne vinegar or lemon juice at the end really brings this sauce home with a small acidic kick. 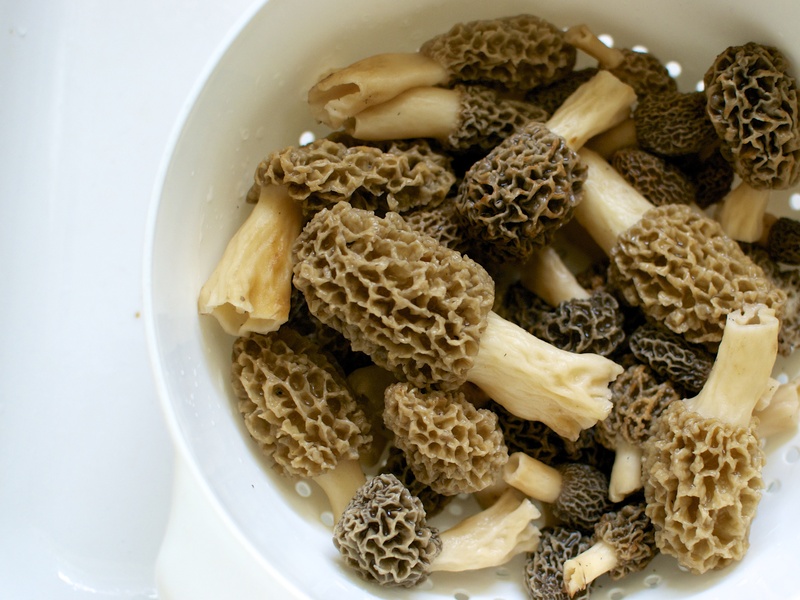 Note – If you are unable to get fresh morel mushrooms, either substitute the mushrooms for equal quantity of cremini or shiitake OR go online and purchase about 2 oz of dry morels. If using dry morels, you will need to rehydrate them. In a small saucepan, bring 2 cups water to a boil over high heat. Turn the heat off and add the morels to the saucepan. Cover the saucepan and soak the mushrooms for 30 minutes to rehydrate. Remove the rehydrated mushrooms out of the soaking liquid using a slotted spoon, gently squeezing out the excess liquid back into the saucepan. Reserve the soaking liquid. Season both sides of chicken with salt and pepper up to one day in advance. Add olive oil (or butter) in a large skillet placed over medium-high heat. Add chicken to skillet bone side up, and cook about 6 minutes per side, turning once. Allow the chicken to become golden brown on both sides. Remove the chicken and place on a plate. Lower the heat to medium. If needed, add another tablespoon of olive oil and then add onion (or shallots). Sauté until soft and translucent, about 2 to 3 minutes. Then add washed morel mushrooms and sauté for a few more minutes. Use a slotted spoon and transfer the mushrooms to a separate plate. Add dry sherry to skillet and bring to a boil. Allow the sherry to reduce by half (about 2 minutes). Add chicken stock and chicken to skillet and bring mixture to a boil. Reduce the heat to a simmer and cover the skillet with a lid placed slightly ajar. Simmer until chicken is cooked through, about 20 minutes. Check chicken after 20 minutes. After cooked through, transfer the chicken to a platter. Add the mushrooms back to the skillet. Add cream, vinegar, and thyme. Simmer uncovered for about 5 minutes or until sauce begins to thicken. Add salt and pepper to taste. To serve, pour the sauce over the chicken on the platter. Sprinkle with additional cracked pepper and fresh thyme, if desired. Notes – recipe adapted from here and here.